With so many of our gadgets getting smaller and more portable, we find ourselves docking, syncing and charging several items every time we come home. What if the docking and sharing of information were a little easier? This concept hinges on the idea of making the PC and mobile gadgets more cohesive while still allowing for a large degree of flexibility and portability. 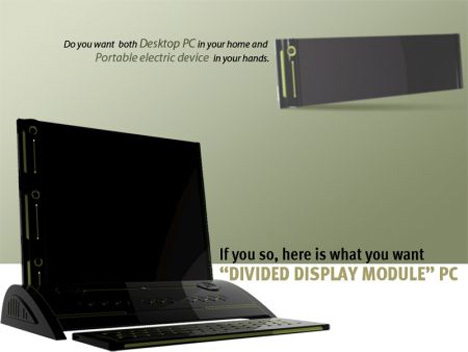 The DDM PC (Divided Display Module) acts as a normal desktop PC when you’re home. 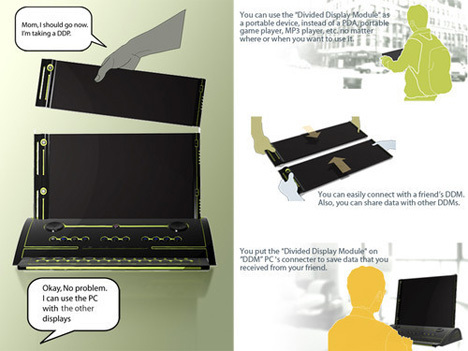 But when you’re out and about, you detach part of the display from the base. The detached part more or less becomes its own handheld device with its own amount of storage that can be used to access music, contacts, books and games. 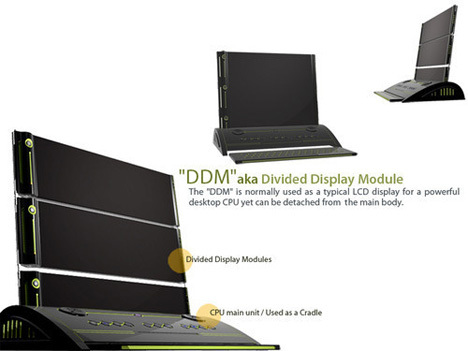 The remaining parts of the DDM can still be used with the base as a home computer. Two or more DDM pieces would be able to attach, so if you run into a friend and want to share some music with them you simply connect your DDM to theirs. The entire concept seems futuristic yet entirely possible. We really hope to see these become a reality soon, especially since the charging iPods, cell phones and handheld gaming systems are starting to take up way too much room. See more in Unbuilt Concepts or under Technology. December, 2009.